Hopefully, this is the first of many informative and educational posts on this forum. What I am going to attempt to do in this post is to identify certain characteristics of natural toning as well as characteristics of artificially/accelerated toning on silver coins. I can add the most value to the discussion by discussing toning on silver coins as that is what I primarily collect and possess the most knowledge about. Admittedly, I do not have a great deal of expertise regarding toning characteristics of copper, gold, and nickel. Maybe someone else can be kind enough to start another post regarding those areas. Additionally, I am not going to get into the chemical equation of the toning process and how doctors do it, what type of chemicals they use, etc.... Someone out there with a PHD in chemistry can probably do a much better job than myself. What I hope to accomplish is to help collectors begin to gain the knowledge and confidence in ascertaining whether or not a coin possesses natural toning or accelerated toning characteristics. So that said, lets get started. Generally speaking, coins tone naturally via AIR TRANSFER. That means that the agent contained in the toning source (usually sulfur in canvas bag, envelope, cardboard coin album, mint set, etc) transfers and chemically reacts with a coin over a period of time through the air. Note: We are not talking about a great deal of distance. Usually, only a few millimeters between the toning source and the coin is all that is required. As you can imagine, a slow drawn out process of air transfer will have some unique toning characteristics that can not easily be repeated in a hasty manner. Generally speaking, most artificial toning methods are done using LIQUID or GAS TRANSFER usually employing some application of heat to accelerate the process. That is the toning agent (sulfur from junior's chemistry set or some other chemical) is transferred to the coin via Liquid or Gas and the chemical reaction is accelerated usually by heat. There are whole host of ways this can be done including, but certainly not limited to, blow torch, bunsen burner, cookie sheets with oil, and just about any witches brew you can think of. Myself and others can probably go on forever about the methods the doctors use, but the important part I want to convey is that toning done in haste has its own revealing set of characteristics. Naturally toned pieces will have depth to their toning. After decades of toning in a natural environement, the toning will look as though it is part of the coin. Artificially or Accelerated toned coins will usually have no substance to it and the toning will appear as though it is floating on the coin versus being engrained onto the coin's surface. How do you tell ? The best way is to hold the coin vertically under a halogen lamp (as close to the bulb as possible) - if the color disappears and the surfaces have a cloudy film to them, its a good chance its AT. Real color will hold under the halogen light. Natural toning environments for the most part will yield consistent colors. A morgan dollar stored in a canvas mint bag will typically yield beautiful blending colors of cyan, yellow, and reds. A mint set or album toned Franklin Half will yield beautiful burnt orange, forest greens, and gold. A seated proof that spent most of its life in a coin cabinet will yield blue, magenta and gold. So if you know your natural colors and your natural environments you can pretty much figure out when you are holding the real thing. And conversely, if someone is trying to sell you a purple and pink canvas mint bag toned morgan dollar, you may want to think twice. No doubt there are exceptions to this rule, I just want to get across the general premise. Natural toning tends to blend within the coin. You usually don't see splotchiness on a natutally toned coin. If you see excessive splotchiness on a coin, chances are its AT. OK - lets apply what I just said between a naturally toned coin and the infamous Peace $ and see if we could spot any red flags doing a side by side comparison. The first red flag was in the story regarding the origin of the coin. The coin was said to reside untouched an envelope for 80+ years. Now, being familiar with envelope toning, my experience has proven that rainbows rarely, if ever, come from envelopes. Usually envelope toning yields golden brown, dusky silver blue, or a pale rose. The toning is usually thick and can some times yield spots of iridescence, but never a vibrant rainbow like you might find from mint bag morgans. So if you knew your natural toning environments and what type of toning they typically yield, a red flag might of went up. Secondly, the pictures may be off regarding the color so although the colors look "off" you can't make that call from the pics alone. However, you can't miss that perfect symetrical ring toning pattern on BOTH sides. That has a too good to be true feel to it. Third, Compare the reverse of the Wash 25C with the Reverse of the Peace $. Look at the lettering. Notice how the toning of the Peace $, runs right over the lettering, take particular note of O in ONE DOLLAR and UNITED STATES OF AMERICA. Compare how the toning runs on the raised portion of those letters versus laying inside the lettering on the Wash 25C. Note the O's, A's, C's U's, on the wash 25C. The toning is inside the letters. The raised portion is not toned in the same manner - only time and air transfer can accomplish that. No Doctor, can ever replicate that look with the same precision. 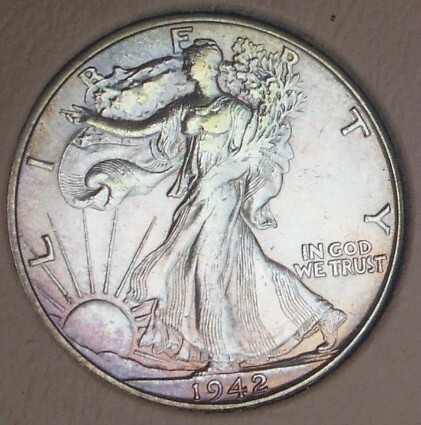 Additionally, note on the Wash 25C, how the toning more or less breaks at the design elements (the outline of the eagle, the perch, branch, etc...) On the Peace $, the toning does not distinquish between recess and raised areas of the design - it runs right over it. I hope this helps and hope no is offended that I worked in the Peace $ as an educational point. All the points made in this post are merely my opinion. Certainly, there is much more to add, discuss, clarify, and debate on this topic. I only have so much time and this post is long enough as it is. At this point I would like to end and encourage others to add, participate and ask questions. Whether you are a dealer or collector, newbie or seasoned veteran, knowledge is the key to this hobby. Lets start sharing it. That's a nice post. I'm going to add one or two things only because this is such a large topic that a thesis dissertation could be written on it. The first is that air is a gas and, as such, air transfer and gas transfer are actually the same thing. If you mean gas in terms of propane or butane then that is different, but many gases behave in a very similar manner. The other is that I always look for the "colors of autumn" on a coin. If you see coins that have colors you might expect from a sunny New England day in the autumn then you can have a pretty good feel that at least it isn't blatantly AT. Aside from that, experience is the key. As you can imagine, a slow drawn out process of air transfer will have some unique toning characteristics that can not easily be repeated in a hasty manner. Hence why NT should bring a premium vs AT. Excellent, excellent post which I shall bookmark. Thank you! Nothing to add except my thanks. Hope to see more of these type posts in the future CT. I usually go with my first reaction when looking at a toned coin. If it just doesnt seem right, I'll pass. If it feels right, I might buy. But since almost all of the coins I buy are for albums, and not for potential resale, if a few are AT, it really doesnt matter to me, as long as I like the look. No. I think there have been many earlier informative and educational posts on this forum. Great info and I think I learned a thing or two. So, I think it's safe to say this is AT? Regardless, that is one beautiful ASE! It would be nice in any collection provided that the price was right and not obscene. Victor, what would you consider the "right price" for such a piece? Thanks CT and a very informative post. I'm not versed in AT/NT but I would like to learn. Knowledge is the key and I thank you for sharing your experiences. Keep em' coming. That SAE is not AT and probably toned inside the holder. You need to go back to GO and start from the top of this thread. Read it twice more and think about it. Notice the golden edge toning? 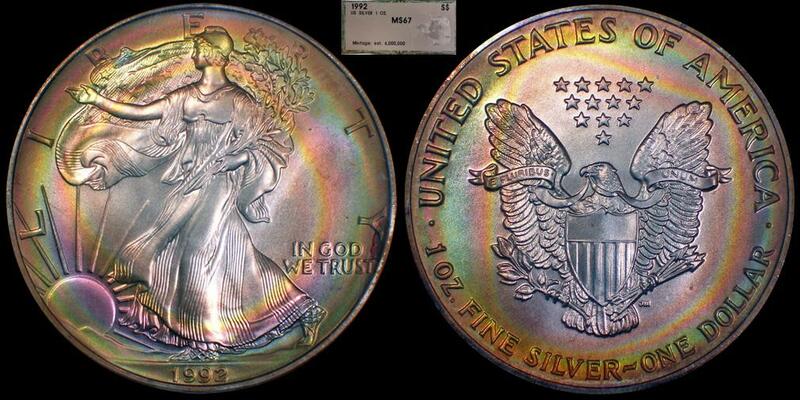 Quite a few silver eagles all in PCI green holders have shown up on Ebay all with this similar toning. A few even showed more progressed toning showing oddly some of the looks of Hayden's coin. The coin you show also shows what looks to be some golden rim toning and is in a PCI green holder. All of these eagles have been sold by different sellers so that probably rules out someone toning SAE's in green PCI holders to be sold on EBAY. Plus quite a few were slabbed by PCI as "100% white" which confirms the toning happened inside the slab. Everything leads up to a high possibility the coin was toned inside the PCI holder. Personally I would guess it's just a fluke with the PCI slab. Almost forgot to add that if anyone is actually toning these in the slab why they would only touch the green PCI holders? 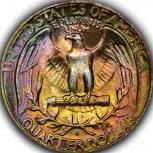 None seem to show up in the gold holders and none seem to be in NGC,PCGS,ANACS or ICG holders. You have to be pretty dumb to be able to tone coins like that just to waste your talent on green PCI holders. It looks like this thread will remain at the top for awhile. I have an affection, no, make that love for tone walkers. I picked up three raw ones off Ebay from the same seller last year that had some outrageous color for very little money. I'm sure everyone thought they were AT. I sent them in to PCGS and two came back in BB because of "questionable color", which after viewing them again, is no great surprise. I took all three to the Long Beach Show a few weeks ago to get the opinions of some dealers who specialize in toned silver coinage. The 1941-p made it into a AU-50 holder and I was told that the darker blue is characteristic of album toning. The 1942-s has the bright shocking blue of a typical AT coin and the 1942-p have colors not usually seen in NT coins. Using CTcollector's criteria for establishing NT, I believe the 1942-p has a shot at being NT because of the difference in color within the recesses to the raised areas surrounding it. Below are pics of the coins. Double market price at the most compared to the untoned piece. While I don't care for the toning on that coin because it is so blatently AT, I wouldn't think anyone was crazy for paying double market for it, at that level. However, the Travisty is that Travis thinks the coin is NT. While I have seen quite a few old green PCI slabs labeled "100% white" while containing toned coins, this particular one did not tone in the slab. All the PCI coins that I have seen toned in the slab had a orange-brown color like the picture you showed. Many have had the tone progress over the entire coin yet none of them showed rainbow colors, especially pastel rainbow colors. The holder aside, this coin screams AT. Look at the toning pattern and the way the tone flows over the devices. Look at the tight bands of color that go completely around the coin. Look at the progression of the colors. Even the pastel colors themselves (and I believe they are very close to the color in hand) say AT. As I said, re-read the first post in this thread carefully, then take a good look at that coin. Gary, here's my 1942 S Walker. It is not AT, per se, but its toning was accerated in a Wayte Raymond album. Thanks to everyone for their responses. This post got some great participation and was well worth the effort. I am really happy Bob, I and some other fellow collectors decided to get an educational forum going. Hopefully it could help make the difference this hobby so desperately needs. I would agree with you if I saw this toning on any other type of coin that it's AT. However this coin does not scream AT when I look at it. As Victor just pointed out in Shane's thread the kennedy he posted is AT by the standards set in this thread. Somecoins will break the rules and I believe this to be one. What would stop the PCI holder from toning a coin like this? PCI holders are proven to tone these coins so I see it very possible the holder toned it. It's very odd this coin and others with a very similar toning pattern would happen to show up in the PCI green holders. Great thread overall - learned some valuable info here. 1)What agent in the PCI holder caused the coin to tone ? And does it consistently yield the colors that are currently on the coin ? 2)If the coin toned in the holder - would the toning be thicker at the periphery or even throughout the coin ? 3)Why doesn't the toning break or change at the raised design elements and lettering ? 2)It may vary with each toned coin but since the periphery of the coin is closest to the insert that holds the coin (which I suspect is the culprit) it would not surprise me to see thick periphery toning. 3)Probably a symptom of PCI holder toning. I purchased this ASE and this is 2 of the original 3 auction images, except for being resized. I hope the seller doesn't mind me using them. I thought it was interesting and see some similarity between this one and the previous post.